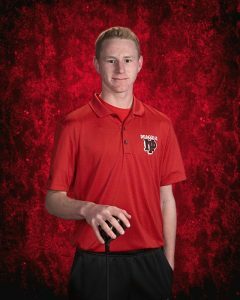 The New Palestine boys golf team won its first triangular match of the season Tuesday at Hawk’s Tail in Greenfield. The Dragons shot a nine-hole score of 159 to beat Greenfield-Central (168) and Whiteland (170). Quinn Dobbins was the match medalist, shooting 36. Chris Guhl, Matt Barada and Braden Baker all shot 41. The Dragon JV also won, shooting 188 to beat G-C (202) and Whiteland (204). The Dragons (2-0) are next on the course Thursday afternoon at home against Knightstown. Quinn Dobbins shot 36 Tuesday at Hawk’s Tail.